NewBay Media has announced the winners of the 6th Annual Pro AV Spotlight Awards, awarded in cooperation with InfoComm International. Chosen from entries received in nine categories, the Pro AV Spotlight Awards honor installations across the breadth of AV vertical markets. The following installations were honored for technical design, innovation, and how instrumental they were to their clients’ missions. These winning installations stand out as powerful examples of the essential role of AV in business, ministry, and the advancement of culture, education, health and public service. For more details on these installations look for the upcoming July issue of Sound & Video Contractor. Located at GE Digital Energy’s new $50 million, 200,000 square-foot headquarters, the Experience Center is an immersive, museum-like environment that educates GE’s customers and partners on digital energy products and solutions through interactive touchscreens, kiosks and a 58ft. 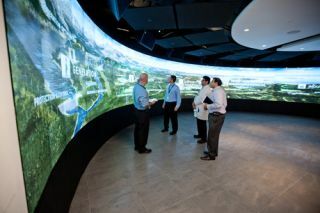 180-degree curved Prysm LPD videowall. Life-size, high-resolution, multi-touch surfaces add spectacular interactive dimension to the lobby of the new visitor center at Boston’s Northeastern University. Featuring three large-scale interactive display areas, it is an engaging high-tech, high-touch space for the 70,000 potential students and family members who visit each year. Goodman Hall is a multi-level, 270,000-square-foot clinical outpatient and imaging facility with an auditorium, boardroom, divisible training/conference rooms, collaboration space, and observation rooms. The solution includes extensive Cisco telepresence, as well as full-time technical support and asset management and tracking. Santa Barbara County went from a 1,600-square-foot trailer with a projector and a small TV to a new 11,000-square-foot building with integrated information sharing from various internal and external sources, including news media, incident maps from geo-spatial services, live video streams from a county helicopter, and operational reports. SFJAZZ Center is the new home of SFJAZZ, one of world’s preeminent organizations promoting jazz performance and education. The purpose of the audio system was to provide uniform, high-quality sound reinforcement for performances, recording, and broadcast in a small flexible auditorium that seats 350 to 700 people. This is the first installation in the world to use Meyer Sound’s Constellation acoustic system to flexibly adjust the acoustical ambience of dining spaces. Patrons experience an ideal balance of “lively buzz” and the ability to converse comfortably without excessive background noise. Constellation achieves this by picking up ambient sounds from the room using dispersed ceiling microphones, processing the sounds in real time, and re-distributing the sound using a large number of small, self-powered loudspeakers. The 72-story skyscraper known as The Shard was inaugurated in July of 2012; The View from The Shard visitor attraction enables Londoners and tourists to enjoy 360-degree vistas from 800 feet above London—almost twice the height of any other viewing platform in the city. The AV system entertains and educates, as well as delivering digital signage information for ticketing and for corporate events. A simple-to-use AV network connects 30 locations throughout the building presenting information, video, and meeting support for various spiritual, outreach, and charitable activities for church members and the general public. All locations including the Grand Chapel, Seminar rooms and Public Information Displays can all be updated from the central server. After a decade of conceptual design by SBU, the Reality Deck is the world’s first 1.5 billion pixel immersive display, comprised of 416 tiled high-resolution LCD monitors in a four-wall surround layout. The pixel density is sufficiently high to saturate the resolving capabilities of the human eye over a very large working area, providing unique visualization platform for large-scale scientific data visualization and for research into novel user interaction methods.